We left for our family trip to Toronto for our dear father’s and grandfather’s 13th Yahrzeit. We left at 7:00 PM with myself, my wife Serka, and Sholom in the car. We picked up Eli at his apartment and then Tzvi at the corner of Michigan and Roosevelt. We drove for over 4 hours and reached the Comfort Suites Inn in Birch Run, MI about halfway to Toronto. We always stay at a Comfort Suites Inn for the free breakfast. Woke up at 8:00 AM. Went to the parking lot to daven. I love the quietness of the outdoors when I am on the road. Used the Siddur I got for the Jonah Parker Bar Mitzvah. Had a breakfast of oatmeal and fruit. At 9:00 AM drove to visit a nursing home in Saginaw, MI. Impressed. Back on the road to Toronto at 11:00 AM. Arrived in Toronto at 5:00 PM. Davened Mincha and Maariv at Lubavitch. My brother-in-law, Yisroel, davened maariv before the amud for the yahrtzeit. Davened at the BAYT. Went to the “Feld” (Cemetery). Gave Victor his scooter.We said Tehillim. Said a El Maaloh and Kaddish. I read the headstone’s words in Hebrew and translated. Yisroel, my brother-in-law, spoke very nicely about Elul. Said a Kal Maalah by Uncle Marvin Lister. Passed by Baruch Javasky and told my kids about him. 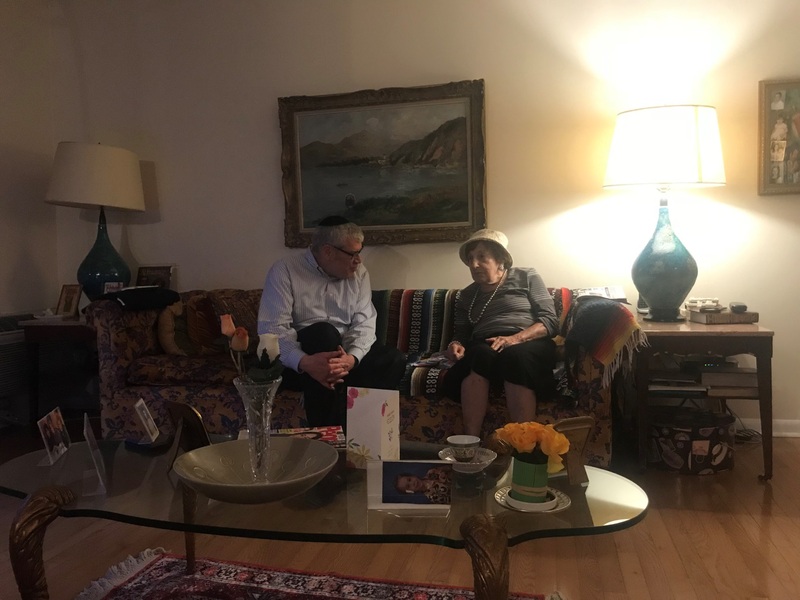 Went back to my mother-in-law for a Yahrzeit meal. She always puts out a delicious spread. Was very B’Simcha that my daughter and son-in-law drove in with their two kids. It was nice to have my kids interacting with their Toronto cousins. Later in the afternoon went onto my mother-in-law’s balcony and learned Daf Yomi. I did two Blatt. 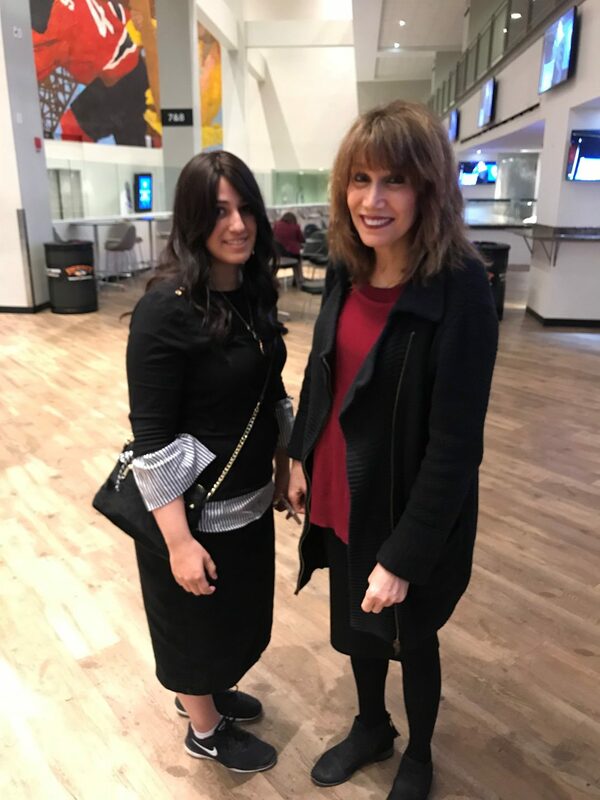 7:00 PM – went to Shul, the BAYT, https://www.bayt.ca/ . Came right before Ma’ariv and Rabbi Daniel Korobkin was speaking on the Parsha. He talked about Achdus and it seems that Achdus in Toronto is fraying at the seams. Not sure what he was referring to. I believe it was about Eitz Chaim having trouble and consolidating their three campuses into two. After Davening went to pick up Mordy and Rivkie who are staying at Eli Janowski’s house, right near the BAYT. Walked to my mother-in-law for a delicious Shabbos meal. Davened at the 7:30 AM Hashkama Minyan. On the way met and talked to Dr. Klein, a physiatrist. Rabbi Diena spoke. He just graduated college (I think his degree is in one of the sciences) and decided to take time off and learn in Kollel. He will learning in the Kollel Torah MiTzion Kollel. Rabbi Diena spoke out the Ba’al Haturim on Chapter 13, Verse 2. This Bible portion talks about false prophets. Verse 3 says, “If there should arise in your midst a prophet or a dreamer of a dream . . .”. On the third word in the verse is בְּקִרְבְּךָ֙ . The Ba’al Haturim says that the gematria, numerical equivalent of בְּקִרְבְּךָ֙) 324) is the same as, Zo Haisha (324). The plain meaning of the Ba’al Haturim is as the Sifrei says that the Bible portion of a false prophet also applies to women. There is speculation that the original language of the Ba’al Haturim was בְּקִרְבְּךָ֙ נָבִ֔יא is the same gematria as Zo Ha’Isha U’Benah, this refers to the woman and her son – meaning Mary and Jesus, as being false prophets (both are 387) but was censored in the middle ages. After Minyan, attended a great Minchas Chinuch Shiur by Rabbi Effie Kleinberg on the Mitzvah of Living in Israel. 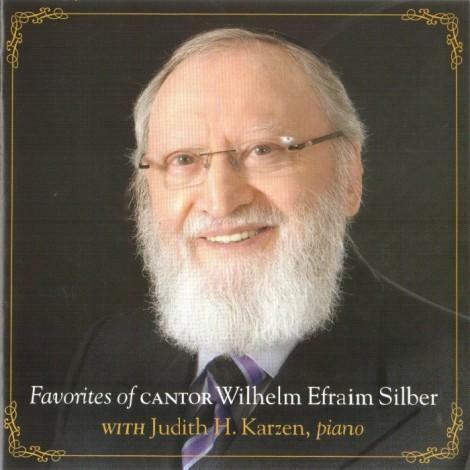 Great, great Shiur. After the Shiur spoke to various people. On is a radiologist who will be in Chicago in October for a convention. Went upstairs to listen to the Rabbi’s Drasha. I am embarrassed to admit, but I have zero recollection of his speech. After the speech went to pick up Rivkie and my grandkids. She was not ready to go. I walked outside the house and decided to say hello to the first person I met. It was my cousin’s kid, Yummi Javasky and family. His parents are Jerry and Shelly Javasky. We stopped by his grandfather’s grave in the cemetery. Yummi and family live in Israel and were in Toronto for a month. It was great seeing him. His parents are great people. His father managed a mutual fund for McKenzie. His mother took in special needs kids as foster kids from birth for a few years until the parents could get back on their feet. Rivkie was going to walk directly to my mother in law. Mordy and I were going to visit family. We walked to Lubavitch. On the way we met the Bidners. We played Jewish geography. Shockingly, Mordy knew of their son. Made it to Lubavitch at 12:30 PM. Mordy met his cousins, the Schechts, his cousins who he never met before. Their mother is his aunt and he knows here quite well. Walked with Schmuli Bernstein and kids to his house on Esther Crescent. Schmuli’s wife is my niece. When I married into the family in 1980 she was a kid of 7 – 8 years old. She looked like a flower child. We caught up. It was great, Mordy dominated the conversation’s. Mordy and their 22 year old son,. Label, know many people in common. Left at 1:50 PM and made it back to my mother-in-law at 2:00 PM. We caught a little flak for coming so late. Great meal with the kids. At 6:30 PM went to Shul for Daf Yomi being given by Rabbi Diena. Met my wife’s nephew, Mordy Rothman, who runs Chai Lifeline in Canada. Davened at the BAYT. There was a Bris. Went back to my mother-in-law for brunch. At about 1:00 PM we went to North York General to visit Aunt Ruthie Lister, Marvin’s wife. Aunt Ruthie is 96, however, has been in the hospital for a year. She had he wits about her and it was important that my kids got a chance to see her. Her daughter (who was my Shadchan with Esther Chase) visits her mother every day is with her the better part of every day. Finally hit the road at 3:00 PM and arrived back in Chicago at 1:00 AM the next day. Eli did most of the driving. In the cemetery with Cousin Hillel and Cousin Shimmy. Learning Daf Yomi on the balcony. On the balcony in Bubbe’s condo right before leaving Toronto. In the hospital with Cousin Beverly. Eli with his Horton’s coffee, Eh? 1:00 PM – Arrived at Midway for my flight to LaGuardia. Very excited. I have a carry-on case and a suit bag. I took two suitcases for Chani to bring things home. 4:00 PM – Arrived at LaGuardia. Netanel, Karen’s kid, picked me up. We had a long bumper to bumper drive to my cousin, Avi Maza, in Highland Park, NJ. (Our mothers are sisters.) Received a call from my co-worker that he is leaving MB. Big blow. 7:00 PM – Arrived at Avi’s house. His wife served us a delicious supper: chicken, turkey, soup, rice, salad, hot dogs. We met Avi’s kids. Netanel talked about his college experience at Queen’s college. Netanel sparkled. Avi’s daughter is not sure where she will go to college and they talked about the options. Went to Mincha at Congregation Ahavas Achim. 8:00 PM – Went to visit my Aunt Shirley. She is in her mid 90s and lives two blocks from her son. Spent 20 minutes visiting with Aunt Shirley. I have not seen her for well over 5 years. We caught up on old times. I called my mother and put her on the phone with Shirley. Aunt Shirley and her husband, Rabbi Yosef Maza TZL, would come into every Simcha and I miss seeing her. She is the life of the party. I love her family. Her ability to play Jewish geography was unsurpassed. It was important for me to go and I thank God that he allowed me the opportunity to visit. 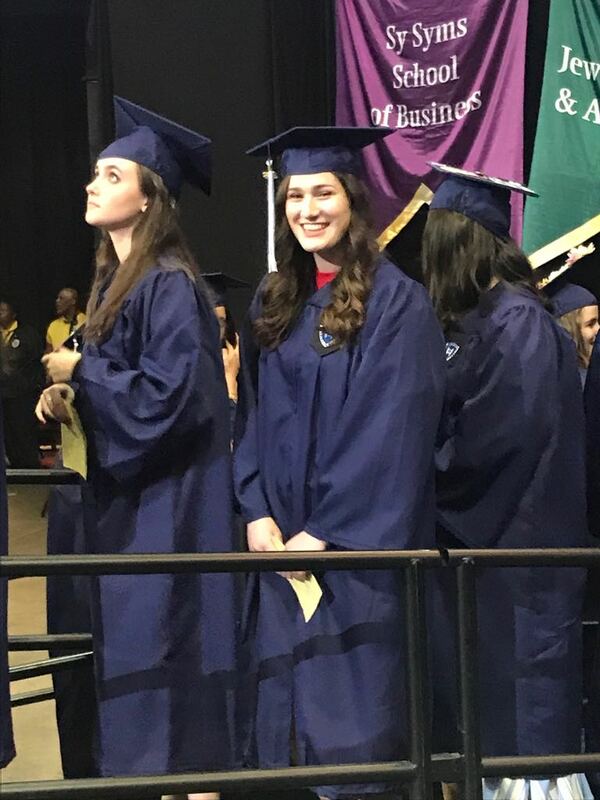 My daughter’s three years going to Stern College and my paying full tuition for all three years was worth it just so that I could come into her graduation and visit Aunt Shirley. I still regret my loss that when my Uncle Yosef Maza, was ill, I did not visit and stay with him for a Shabbos. 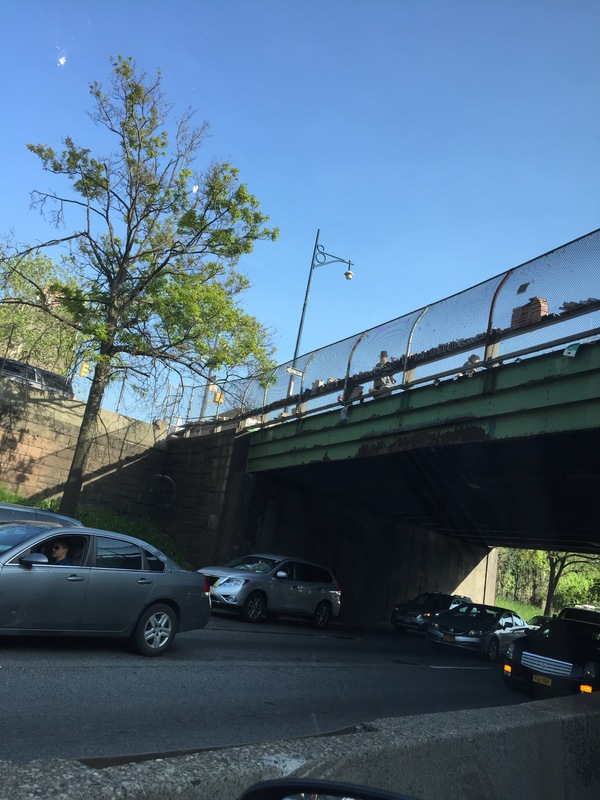 Only in New York/Brooklyn – Driving on the BQE through Williamsburg, a Seforim seller sets up his wares on the overpass. How does he move it at night or when it rains? 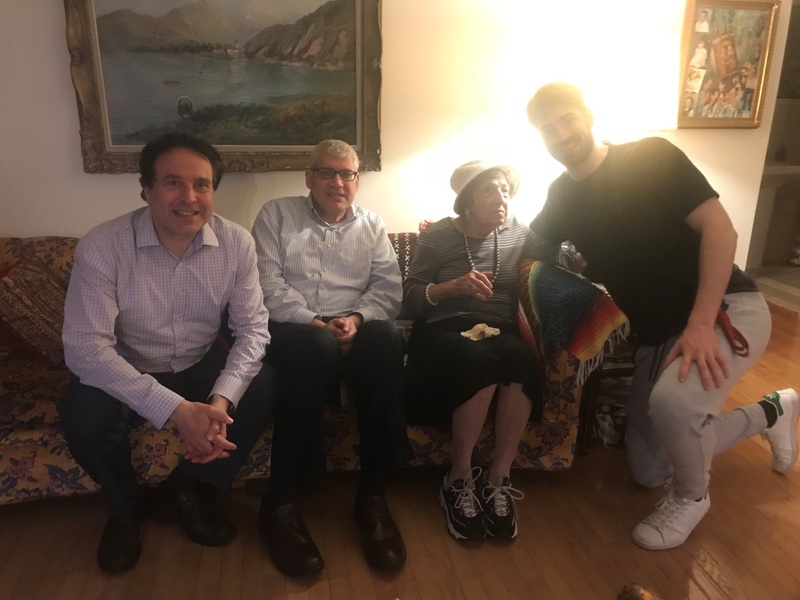 9:00 PM – davened Maariv and went back to Avi’s house. I was a pleasant mid-May evening so we sat on his deck and talked. I never realized how we had some similar life experiences. 10:00 PM – went downstairs and slept in a very comfortable bed. 6:45 PM – davened Schachris. Had Rice Chex for breakfast with Avi. 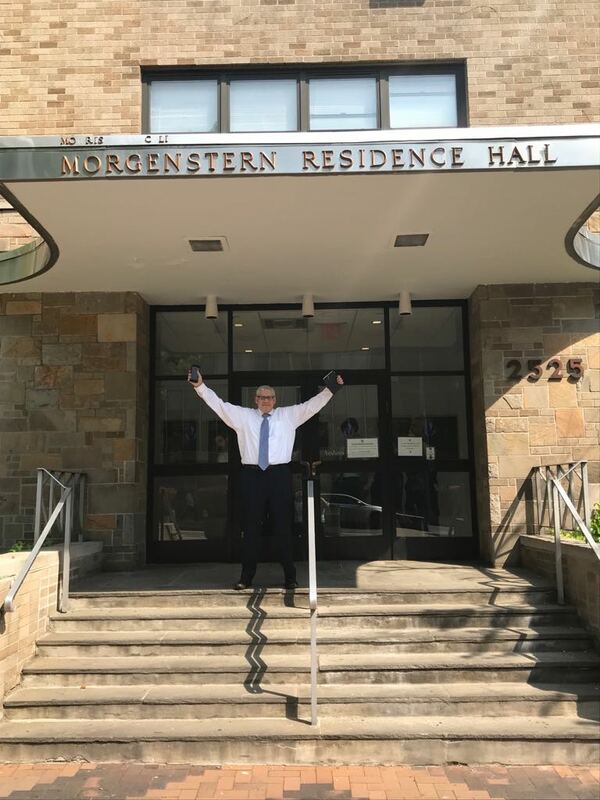 9:45 AM – Rabbi Schwarzberg picked me up to drive me to YU. He is the director the YU’s job placement office for Rabbis and Kollel members. We had a great one hour trip. We played Jewish geography. Rabbi Schwarzberg knows everyone. He is great for his job. Rabbi Schwartzberg was the former Rabbi at Ahavas Achim, the main Shul in Highland Park. On Shavous he plans to speak about running in Halacha. I told him my vision for YU. They should open up Yeshivas based on YU Hashkafah, meaning Torah Al Pi Brisk, with a healthy sense of the world around them. They should use their Talmedai Chachomin and open up Kolleliem similar to Lakewood Kolleliem. 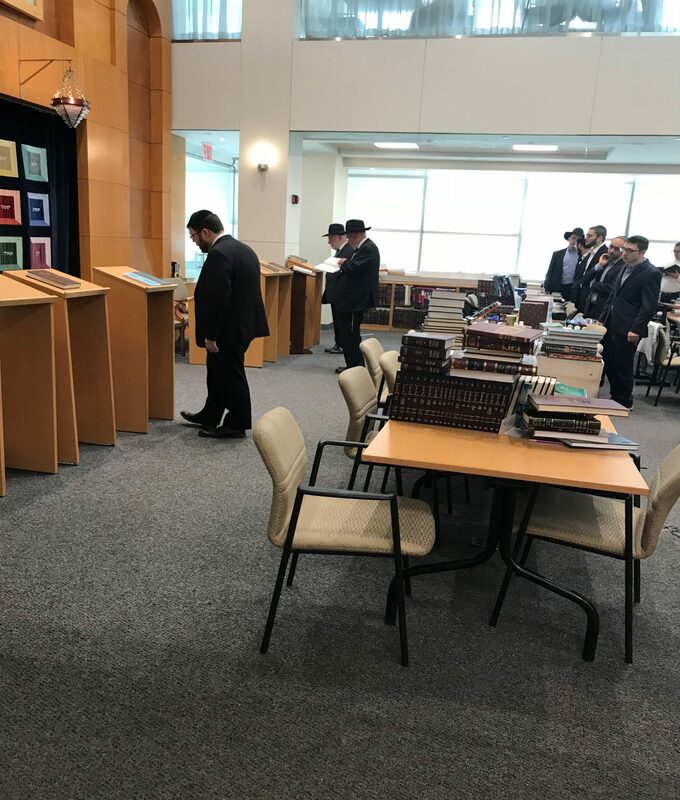 Boca Raton needs a Kollel. 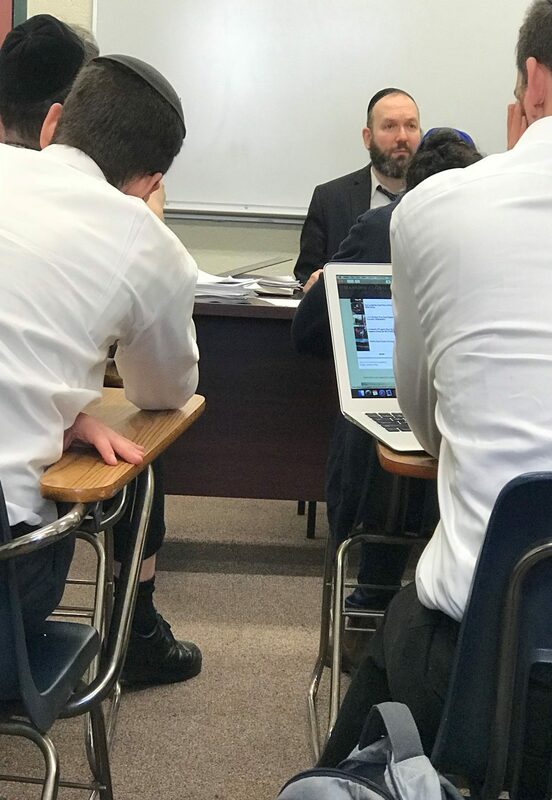 Rabbi Reichman, Rabbi in Englewood, New Jersey should be set up with a Kollel and eventually a Yeshiva. He told me the issues. I feel that despite them, it should be done. 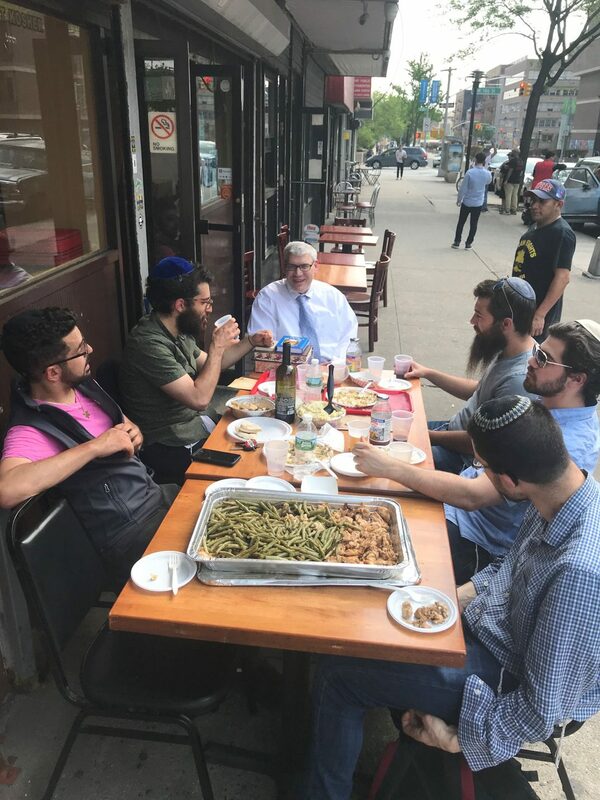 We talked about the greatness of Rabbi Aaron Rakeffet-Rothkoff, Rabbi Herschel Reichman, Rabbi Korobkin, Rabbi Dovid Hirsch and other YU Rosh Yeshivas. I told him about Michael Parker’s Bar Mitzvah. I told him how I spent a beautiful Shabbos in Toronto when Rabbi Rakeffet-Rothkoff was a scholar in residence. 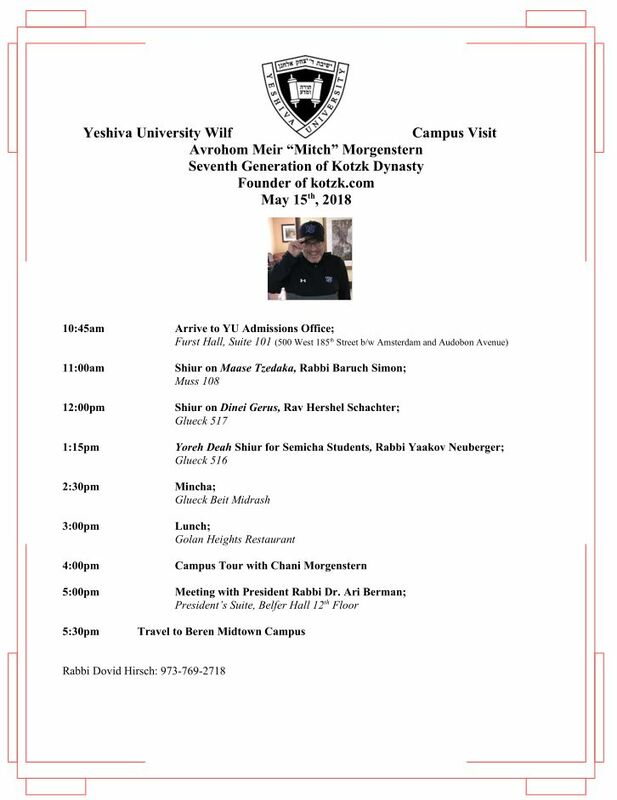 I heard Rabbi Rakeffet-Rothkopff speak Friday night, Shabbos morning, and Mincha. I found out were he was eating the Shabbos meal and I popped into the house. It was by the Zeifmans. Zeifmans’ accounting company is used by my wife’s family and he knows my family. After Shabbos, I made sure to get a ride home with Rabbi Rakeffet-Rothkoff. I admire Rabbi Schwarzberg. He advised a Rabbi not to sign on a nonsense Kol Korah against a well respected friends of ours. Unfortunately there is a tendency by some to hurt people they do not agree with and justify it religiously. The Kotzker has a Vort on this. 10:45 AM – arrive at YU and went to my nephew’s office in the admissions office. 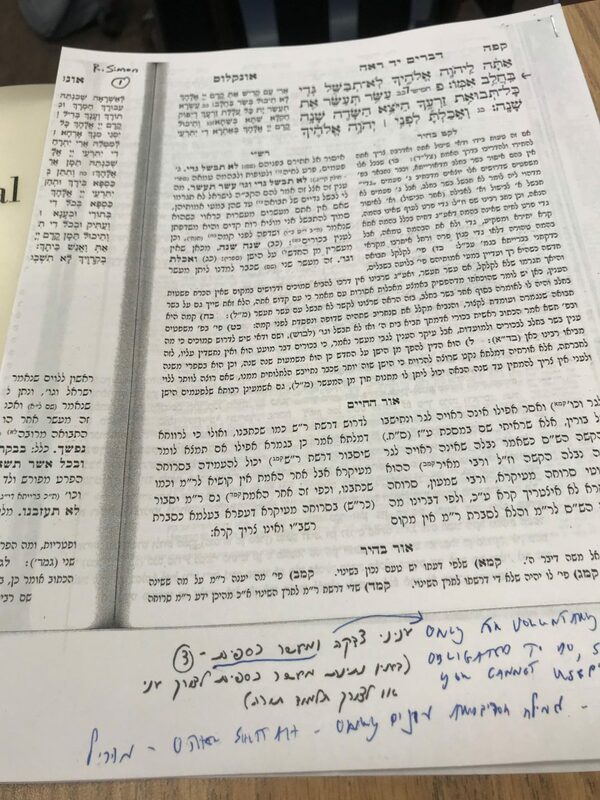 11:05 AM – Put down my things and went to Rabbi Baruch Simon’s Shiur on Maaser Kesafim. Met Amos Weiss, who is retired and is a permeant student at YU. 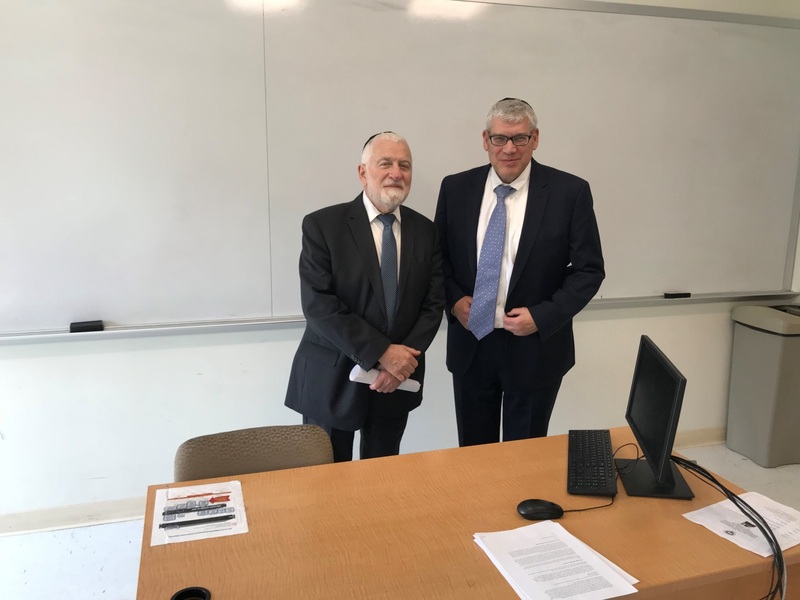 12:00 PM – went to Rabbi Herschel Schechter’s Shiur on the laws of Geirus. He spoke on various questions of conversion. I introduced myself to him and we talked. 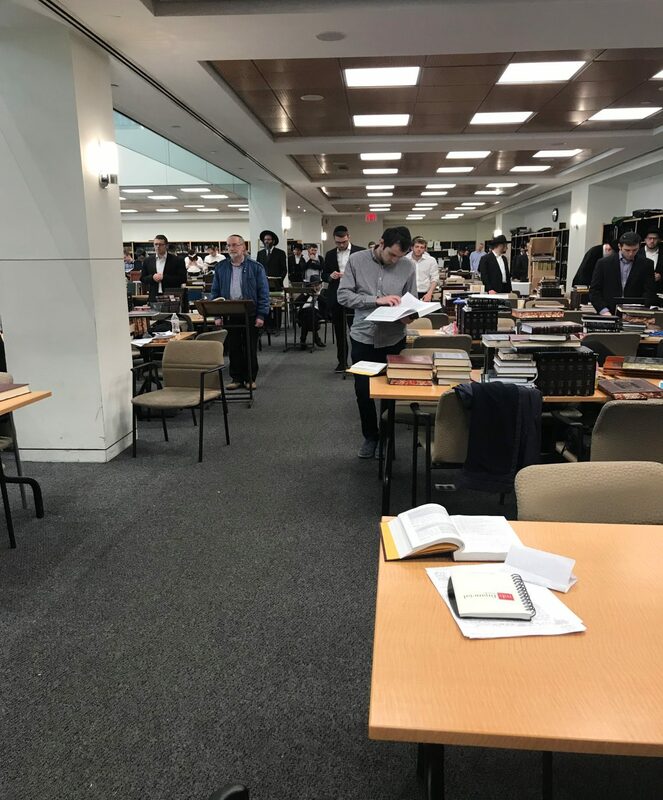 1:15 PM – went to Rabbi Yaakov Neuberger’s Shiur on eating diary on Shavous. I spoke to him after the Shiur. We spoke about Kotzk. 2:30 PM – davened Mincah. Saw Rabbi Reiss and said hello. 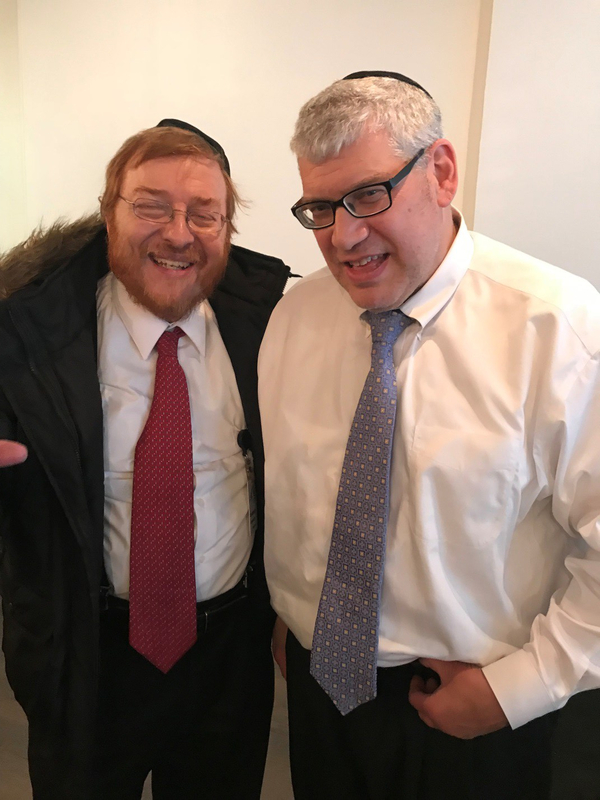 Saw Rabbi Dovid Hirsch and said hello. Rabbi Yaakov Blau came over the said hello . 3:30 PM – went with Matt Schwartz to the Golan Heights for lunch. Chani made it to YU for our visit. Bought a Falafel. Saw a group of 5 guys sitting outside the restaurant. The leader of the group, Danielli, was a teacher at YU and taught Jewish history and was from Toronto. Knows the Janowskis and davens on occasion at the Baytt. Told them a Kokzker story. 4:00 PM – took lunch back to Matt’s office. The Falafel was delicious. 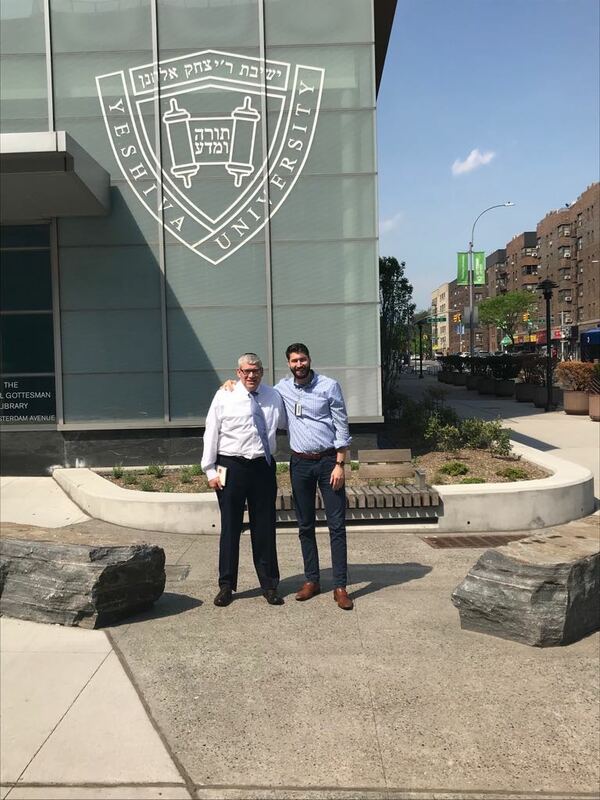 4:50 PM – went to Belfer Hall to meet with the President of YU, Rabbi Ari Berman. 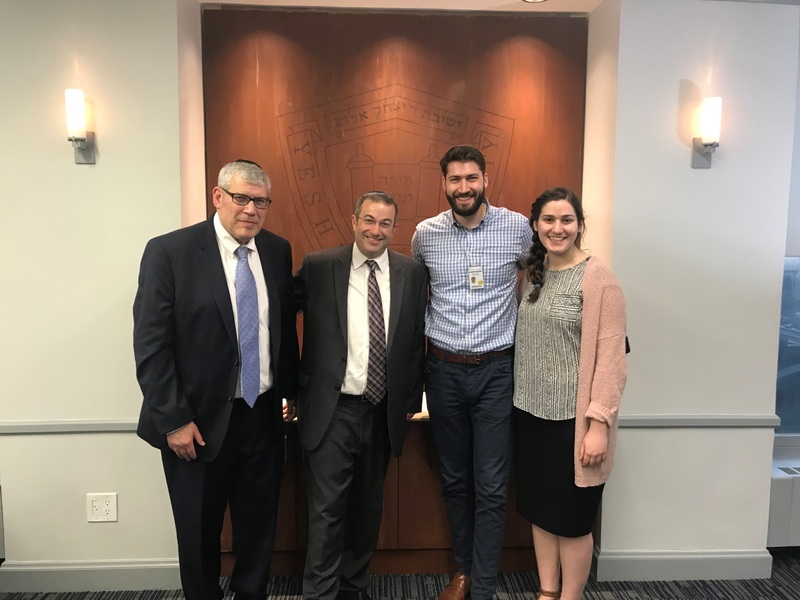 Outside the president’s office with Rabbi Ari Lamm. 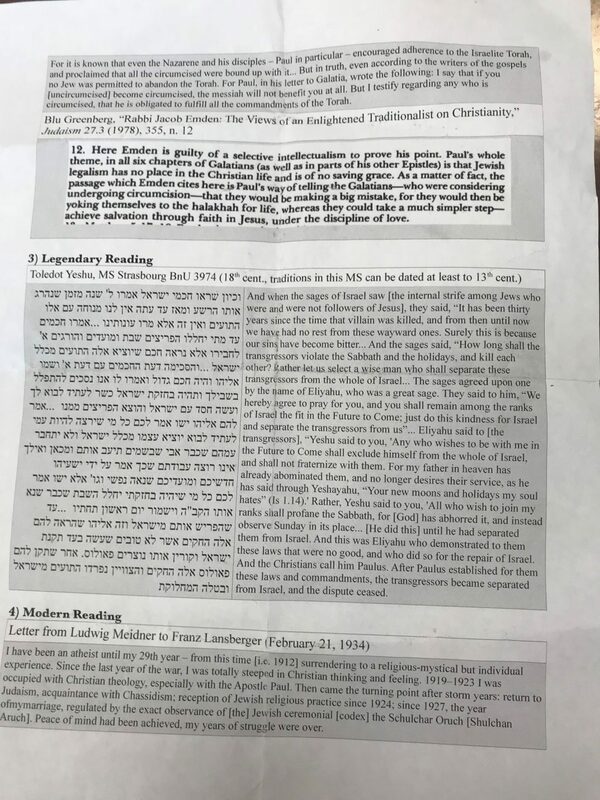 Ari Lamm was in Chicago a few weeks earlier and I attended his Shiur on Paul of Tarsis. I told him that what I got out of if was that Rabbi Yaakov Emden wrote about Paul and understood that Paul was not out to make Jews Christians. Paul was speaking to Christians. Rabbi Yaakov Emden was Malamud Zechoz on Paul. Rabbi Yaakov Emden was intellectually curious and honest. It appears that Rabbi Yaakov Emden actually read Paul in the New Testament. 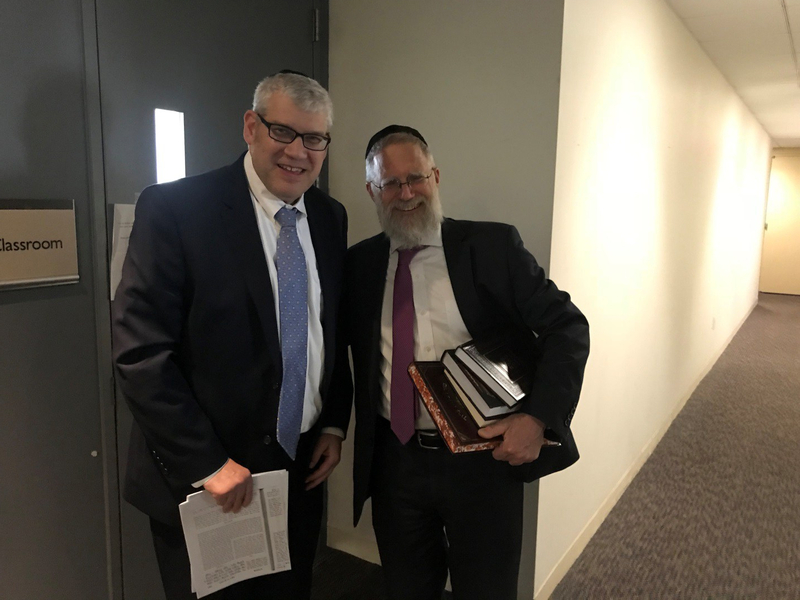 5:05 PM – met with Rabbi Ari Berman. Matt and Chani were with me. I had wanted to talk about my vision for YU. However, I only had 5 minutes and he does not need me to “Hoch him a Kop”. 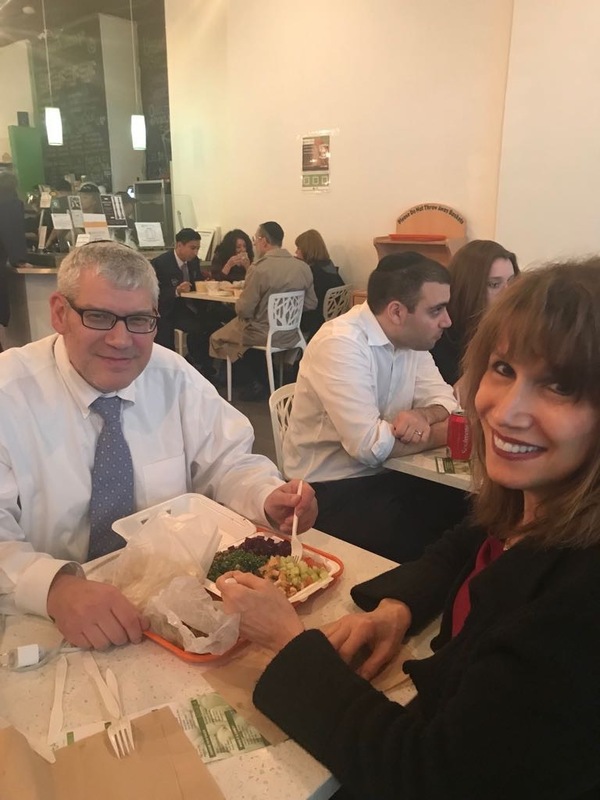 Rabbi Berman had been in Israel the day before for the openings of the US Embassy in Jerusalem. He also had an evening event and graduation the next day. I asked him if he is related to Rabbi Berman head of the OU’s office in Jerusalem on Keren Hayesod. He said no and that over the years they received each other’s mail. 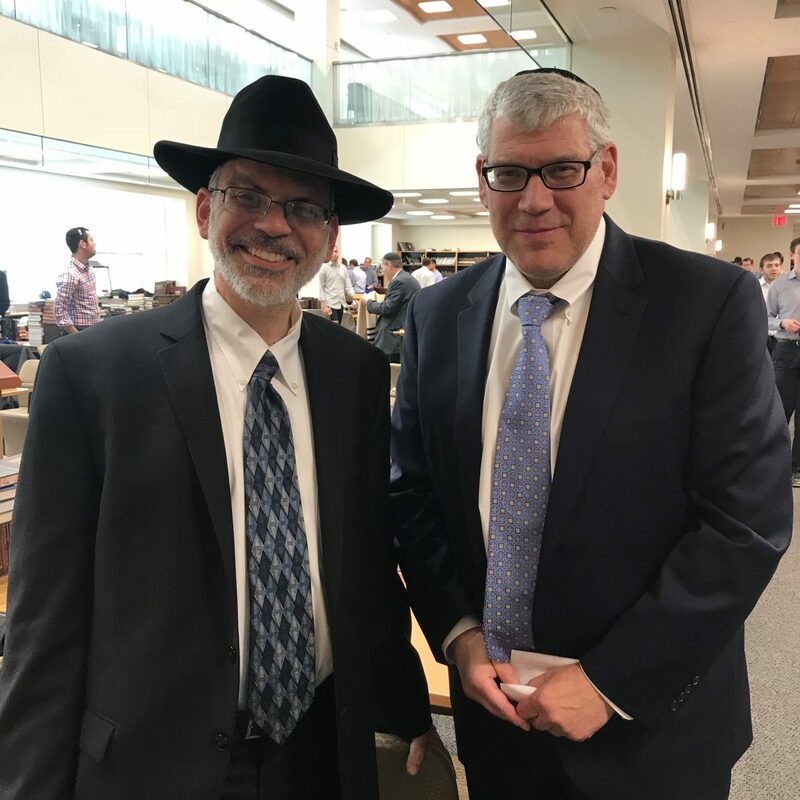 He met the other Rabbi Berman in Israel the day before for the first time. 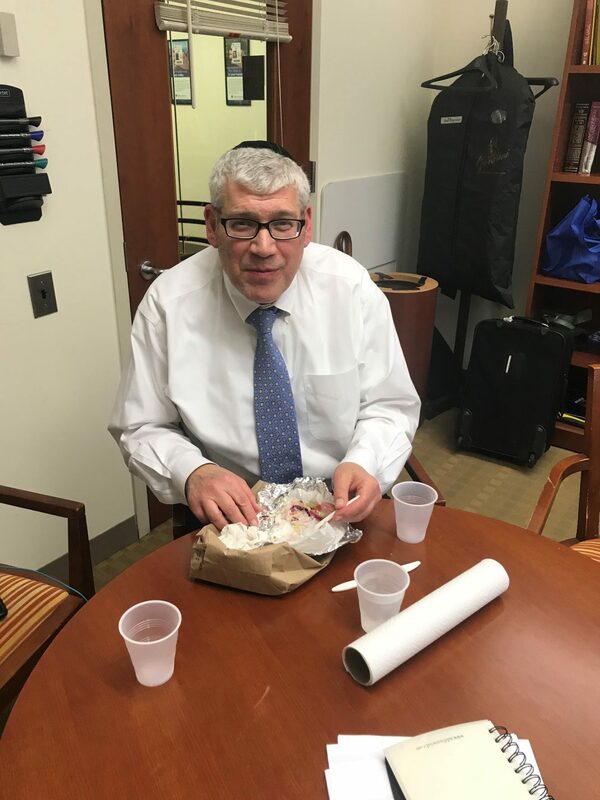 5:25 PM – met Michael Strauss, interim dean of the Sy Syms Schools of Business. He worked for American Express for many years before retiring and going over to YU. 5:45 PM – Tour is over. Had an exhausting, but rewarding day at YU. 6:15 PM got a ride with Matt’s friend to Chani’s dorm. 10:00 PM – Rivkie Morgenstern-Siegal came in for Chani’s graduation and we went to dinner at the Eden Wok. Chani had $45 on her restaurant card. Had sushi and some of Rvikie’s rice noodles. Delicious, but very unhealthy. 9:30 PM – took a Lyft to the Ramada Hotel near Newark airport. $90 Lyft ride. 7:00 AM – woke up with great excitement. Today is graduation day. 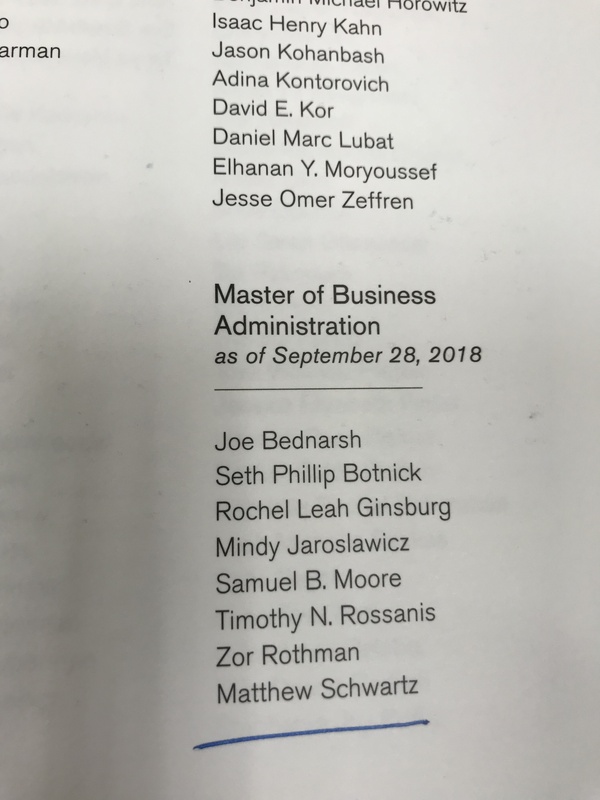 Not only is Chani Morgenstern graduating, but Karen’s kid, Matt Schwartz, is also graduating with a Masters Degree in Business. 7:30 AM – went to the workout room. Met the Ginzburgs from Silver Spring, Maryland. 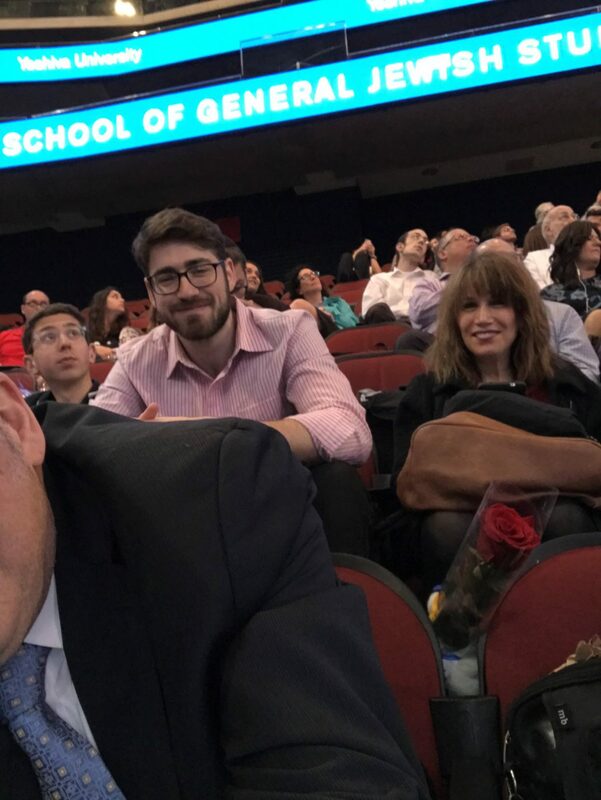 Their son is graduating. 8:15 AM – went to Chani’s room to see if I can be of help. I ironed her graduation gown. 8:45 AM – went to my room to get ready. 10:15 AM – arrived at the Prudential Center where the New Jersey Devils play. So exciting. I was pumped up. Came later then I wanted. Found seats towards the front of the stadium, about 20 rows up on the women’s side. I would have preferred seats within the first 5 rows. Karen and Netanel came soon thereafter, with Amitai coming later. About 10 minutes after we found our seats, the processional started with the playing of Pomp and Circumstance. I wanted it louder. We looked for Chani and finally she was walking. She sat in the fourth row towards the right sideline. We waved and she waved back. 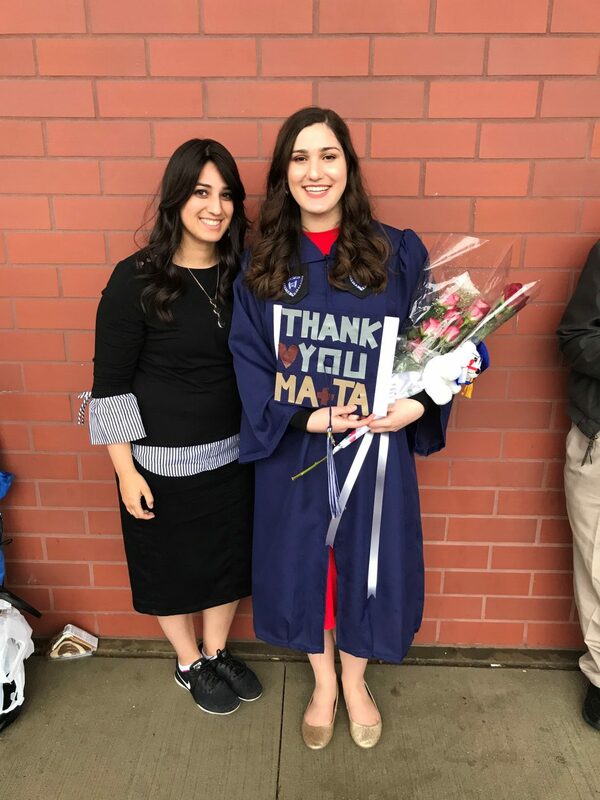 She decorated the top of her cap with the words, Thank you Ma and Ta, so it was easy to always see her. The program was opened with the singing of the national anthem. Ambassador Danny Danon, Israeli Ambassador to the UN, was conferred an Honorary Degree. He was the guest speaker. Former President Ricard Joel was also awarded an Honorary Degree. There was the valedictorian address and a video of the co-valedictorians. Lastly, President Rabbi Ari Berman spoke. I will say that during some of the speeches, nobody was listening. I walked out during one of the speeches and walked around. Many people were outside. Look who I found outside. I ate inside. Netanel made me oatmeal, which as you can see, I enjoyed. Time for the Conferring of Degrees and Diplomas. The graduate degrees were awarded first. 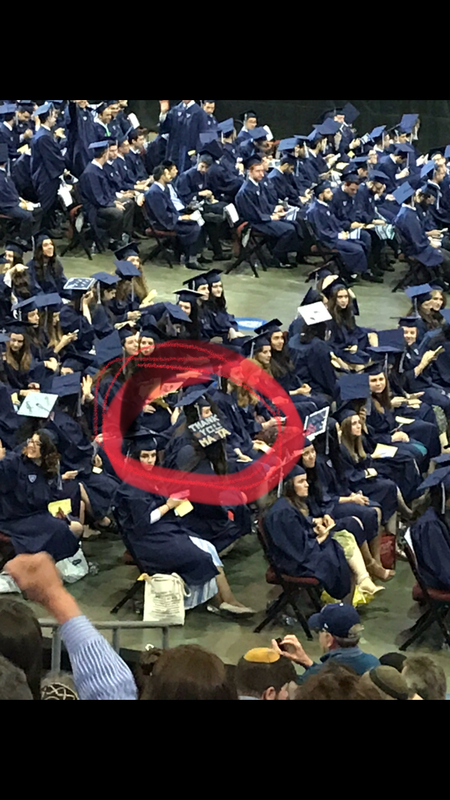 They did not call out each graduate. One person represented the class and was presented with a degree. 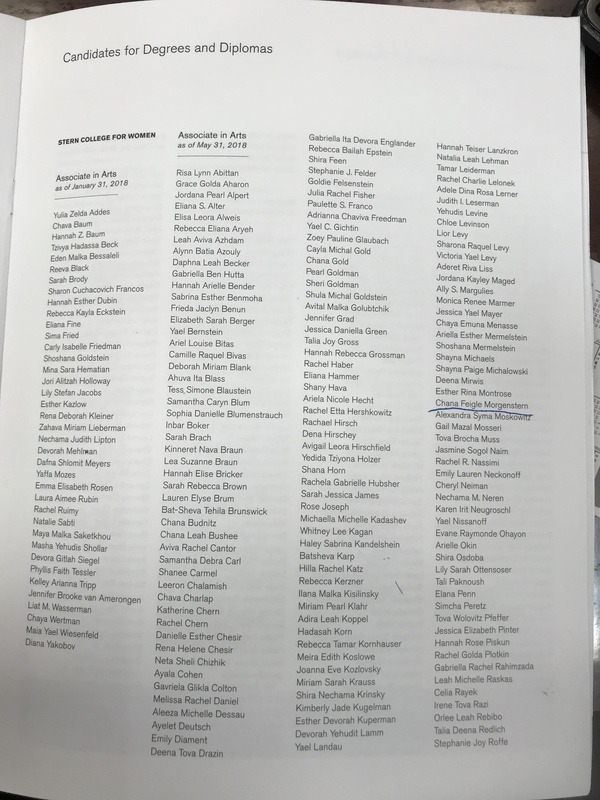 Matt Schwartz represented his class and he was mentioned by name. Time for the Undergraduates. They called out each graduate as the graduate walked across the stage. Each one took a picture with President Ari Berman. With that the graduation was over. Very satisfying. 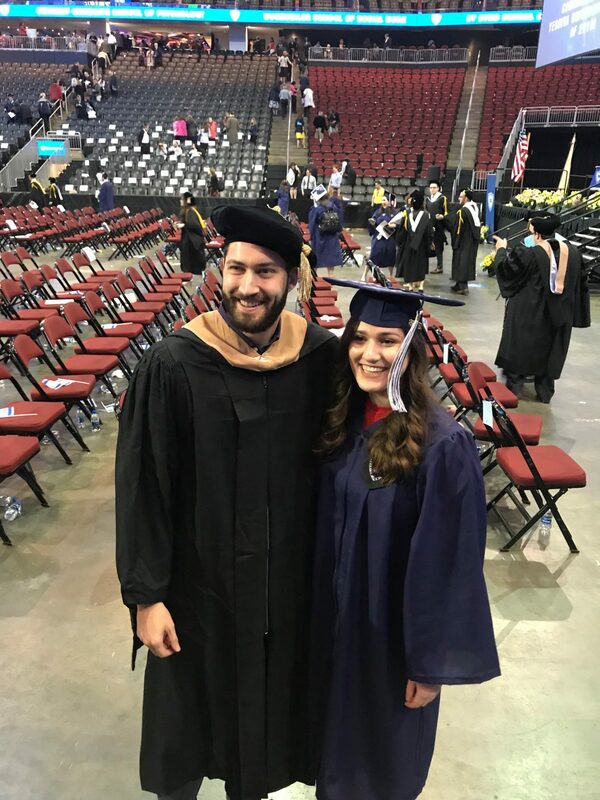 I met Ranan Sugarman whose son was graduating. I met a Sofer from LA, Ron Sieger. Comes out their daughter was with Chani in Michlala in Israel. 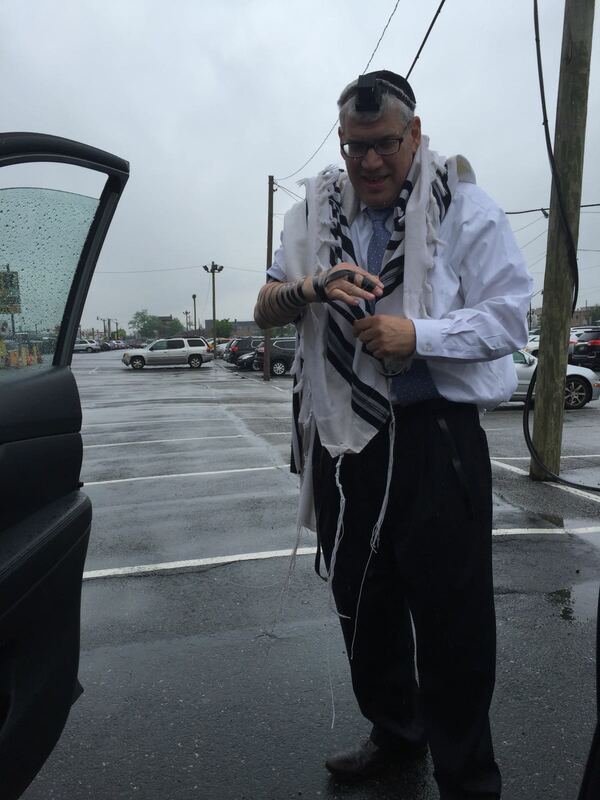 12:45 PM: davened Schachris in the parking lot. 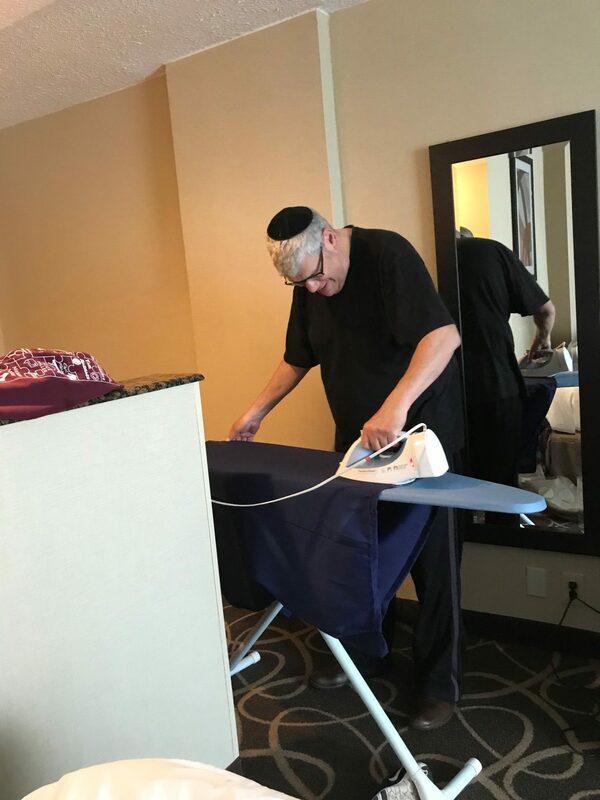 I left my Tefilin in a suitcase that Netanel Schwartz had in his car. 1:00 PM -I texted Avi Maza for a suggestion where we can eat and celebrate with family. He suggested the Green Chickpea, www.greenchicpea.com. It was perfect. It was 15 minutes from the Prudential Center. Karen, Netanel, Matt, myself and Chani walked in and the place was packed. 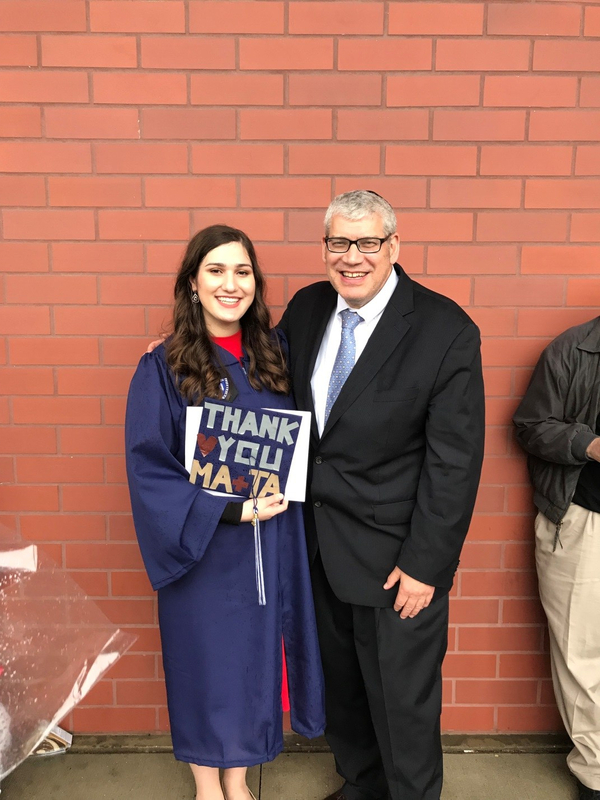 Amitai Schwartz was at the graduation but could not make it for lunch. 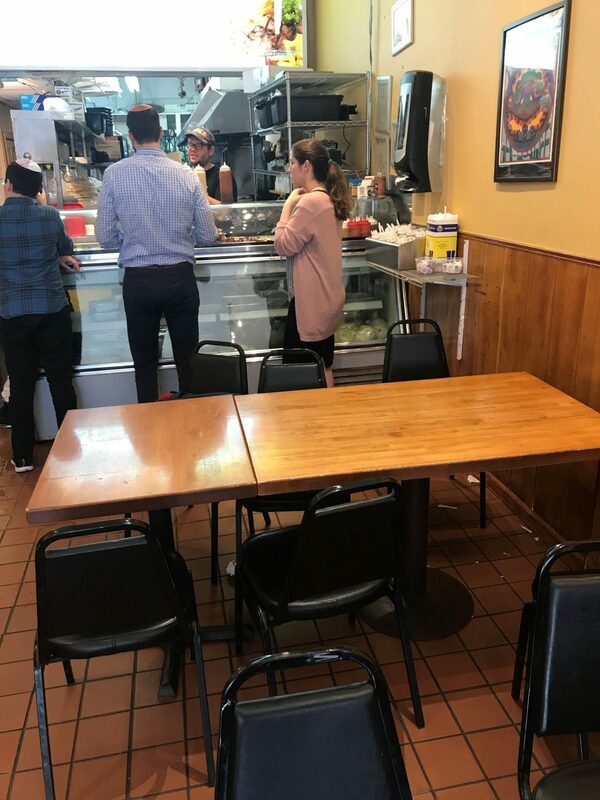 My Rebbe, Rabbi Tzvi Hersh Weinreb, was at the restaurant with his family. His grandson graduated. Additionally, Karen knows Mrs. Weinreb’s sister. I hugged Rabbi Avrohom Kivilevitz. His daughter graduated. I haven’t seen him in 15 years since the left Chicago. 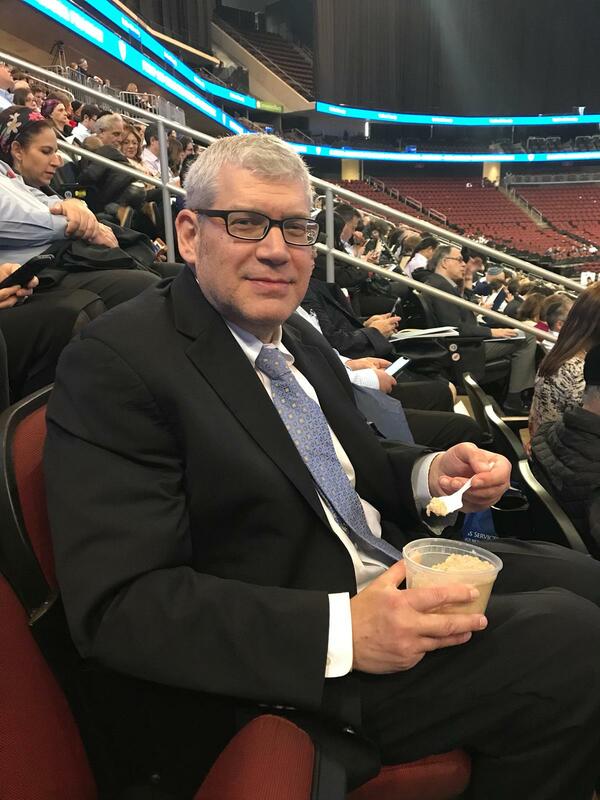 He is the Mashgiach and works at IDT in Newark. I met a family from Springfield, MA. Chani met a friend who is from Chicago. 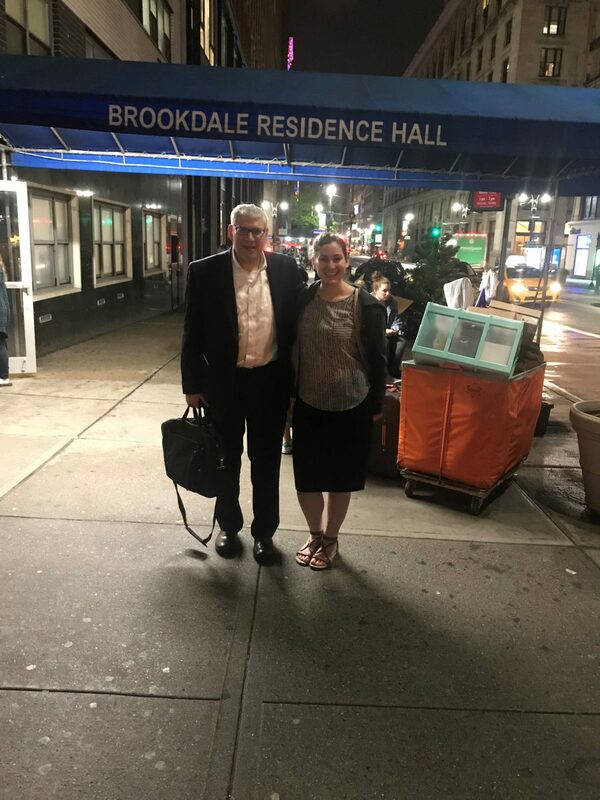 6:00 PM – Netanel dropped us off at Brookdale, Chani’s dorm. Chani had to pack for the trip home. It took longer than expected and we left at 7:35 PM for LaGuardia to catch an 8:55 PM flight to Chicago. We got to the airport at 8:12 PM and I was resigned to missing the flight. Initially we waited in line outside to check out baggage. After 10 minutes we were told to go inside as we came too late. We were in line for another 10 minutes. Chani had to re-arrange her luggage so as not to be overweight in one of the suitcases and not pay the $75.00 overweight fee. The third suitcase was 62 pounds and we had to pay $75.00. We had to take the luggage to the X-ray machine and then go through security. The line was short. We made it to the flight at 8:50 PM. Luckily, the flight was delayed and they did not start boarding until 9:00 PM. Boruch Hashem we made the flight. Waiting in line I met a couple flying to Chicago for Shavous. I know their son-in-law and was happy to do the family a favor. I offered them a ride home from Midway. They took me up on my offer. I was nervous because we had 5 suitcases and was afraid we would not have enough room in the car. As luck would have it, three of our suitcases did not make it on the flight so we had plenty of room in the car. My three suitcases came in the next day at 9:30 AM. I was at the airport to pick up my kids who were coming in for Shavous, so I did not have to make a special trip to the airport. It was Siatta Dishmaya. Summer is finally setting in. The weather is always great. This Parsha has special significance to me. 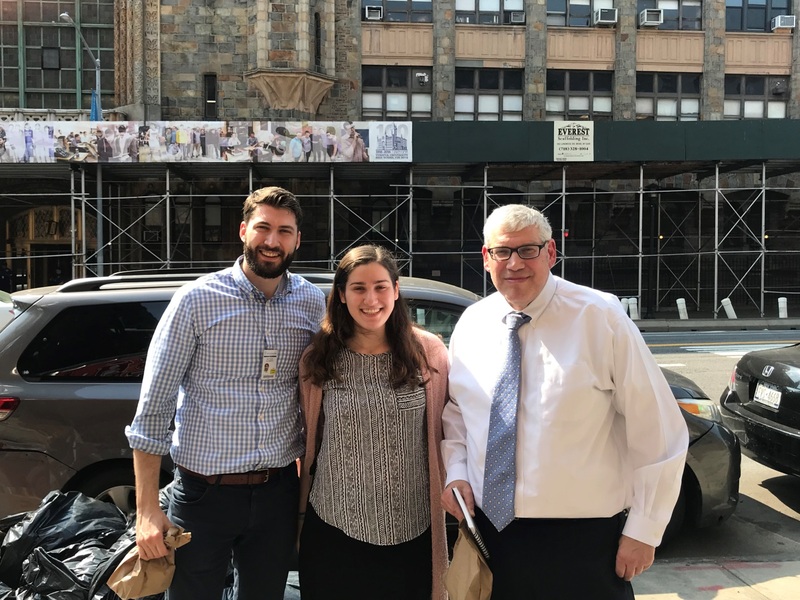 Seven years ago I was by Anshe Sholom sitting at the tables at the corner of Broadway and Melrose; the weather was perfect; it was about 1.5 hours before Shabbos; , I was learning the Parsha, and received a call which made me question a decision I made one year earlier. It was devastating . It took over a year to overcome that phone call. Additionally, on this Sedra I drove to Omaha to visit Rabbi Jonathan Gross. On Shabbos after morning Minyan I went to visit Rabbi Hillel Mandel. I enjoy speaking Torah with him. I came after his meal, made Kiddush, and had some cake. I stayed for over an hour, maybe too long. 1) Every year I learn about Ahron’s chagrin that he and his tribe were not part of the dedication. 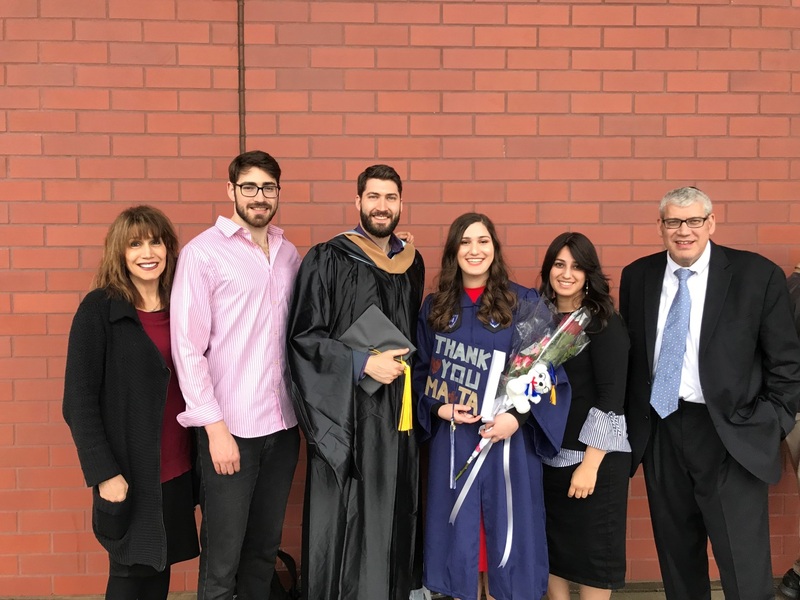 Ahron and his family ran the Mishkan. It was theirs so why was he upset. Why was he not gracious? Was it that he felt he left out because he was not part of the dedication? Seems that this is not consistent with his nature. I have heard answers, but nothing sticks and every year I ask the same question. 2) Chapter 9; Verse 10: If any man will become contaminated through a human corpse or “on a distant road”. . . . Rashi says ”a distant road” means you were outside the Sanctuary during the time of slaughtering the Korban Pesach on the 14th of Nissan, in the afternoon. It seems that almost everyone who did not offer a Pesach offering could do Pesach Shenei, even if he was negligent and could have slaughtered the Pesach offering on the 14th of Nissan. Seems odd. There is the serious punishment of Koras for not bringing the Pesach offering. 3) Chapter 8, Verses 15-23 talk about the Clouds covering the Mishkan, rising upwards, and traveling. It says Clouds 11 times in these verses, seems like overkill. Chapter 10 Verse 29 says the Moshe asks Yisro, his father-in-law to stay with the Jews. This conversation took place right before they left, on the 19th of Iyar or the 20th in the morning. Chapter 10, Verse 33 – they traveled three-day distance, meaning the 20th, 21st, and 22nd, so the Clouds rested on the 22nd at night. However, Rashi says they only traveled one day so it would seem that according to Rashi they rested on the 20th at night. However, further Rashis say that they did travel for three days. Chapter 11, Verse 1 Rashi says they traveled for three straight days and complained. Not sure how to answer the previous Rashi which says they only traveled 1 day. Chapter 11, Verse 1 The Misonenim – Complainers. Had to happen on the night of the 22nd. Chapter 11, Verse 4: Kivros HaTavah. Israel wanted meat. This took place on the 23rd and 24th. At the same time the 70 other prophets were elevated, and Eldad and Modad prophesized. Chapter 12, Verses 1 through 16 – Miriam’s episode lasted for 7 days.- from 24 -30th of Iyar. On the 30th of Iyar they traveled from Chazeros (Verse 16) to Paran. Ranban, – they traveled from one place in the Paran desert to another place. Chapter 13 Verse 1 – The spies which were sent out of the 1st of Sivan. 5) Chapter 31- verse 35 and 46 has the two verses we say whenever the Torah is taken form the ark. 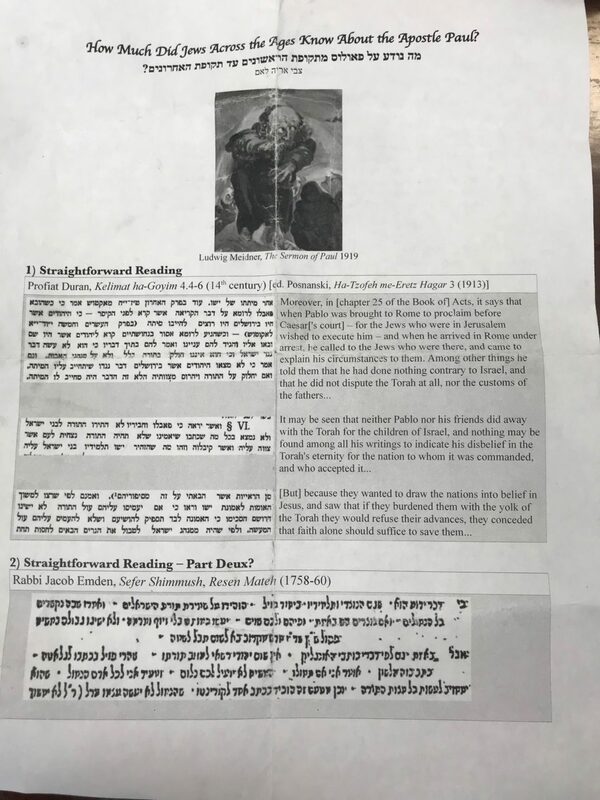 These two Verses are bracketed by the letter NUN, however, backwards. Rashi says He (God) made marks for this passage before and after it, to indicate that this is not its proper place. Where is the proper place? The Gur Aryeh said at Chapter 2, Verse 17. However, the very next Rashi says on the words | יְהֹוָ֗ה ‘ קוּמָ֣ה – “because He had preceded them by a distance of three days travel, Moses says, Stop and wait for us do not move on any further. The next two Rashis are also in the moment and Moshe is saying to God that He should fight against the enemies right now who are assembled to fight the Jews going into Eretz Yisroel. Just like forty years later the Jews fought Sichon and Oag who were assembled to battle the Jews going into Israel. The question is obvious. How could the first Rashi say that the backwards Nuns signal that this is not its proper space when the very next Rashi seems to say that this is its proper place and that Moshe said theses two Verses at this time. This was the first time the clouds traveled and the first time Moshe used this prayer. How is Rashi to be understood? On Sunday I was telling Karen my question and the answer came to me. Moshe created these two Verses as a new prayer to be used when Israel traveled; whether in the desert or if I may speculate whenever they went to war, forced out of Spain, the Holocaust, or when the IDF goes out to battle. Moshe created this prayer back in Chapter 2 Verse 17 and that is the proper place. Each leader saying this prayer must customize it for the needs of the time. It is not just words. Moshe individualized the prayer for the needs of this specific time. Every time a Jewish leader travels he customizes the prayer for that time and Rashi is explaining Moshe’s customization for the first time Moshe used the prayer when Israel traveled in the desert.